Posted on May 11, 2018 at 1:19 am. The end of the year is one of my favorite times. No, not because I am leaving behind my 5 am alarm for a few weeks, but because we are able to reflect upon the huge progress our students have made since August. 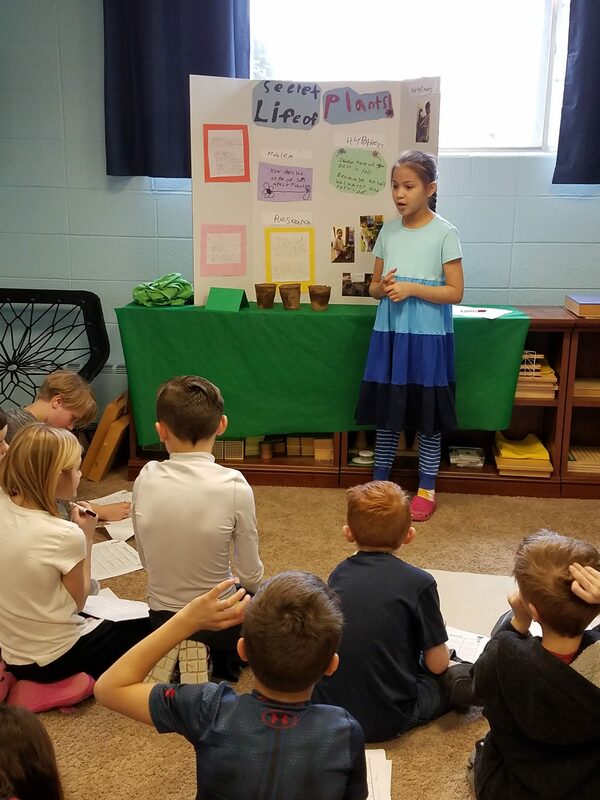 All of our students have become more successful in so many areas – interpersonal communication, public speaking, planning, organizing, managing time, and with all of our wonderful areas of the classroom. 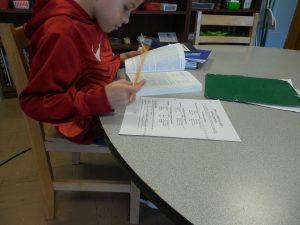 It is inspiring to see the hard work and determination our students put forth every day. They are becoming more independent and knowledgeable every minute and it is really a privilege to be a part of it. At the end of each year, we finish our Writer’s Workshop lessons with an autobiography. Last week we interviewed friends and wrote about them as practice for writing about ourselves. These students are filling out their autobiography questionnaires which they will then turn into a written autobiography about themselves. We will also be making a self-portrait diorama so keep sending in those shoe and tissue boxes! Our fourth year students learned about transitive and intransitive verbs this week. As follow-up work, they had to choose a paragraph to copy down and label the verbs. 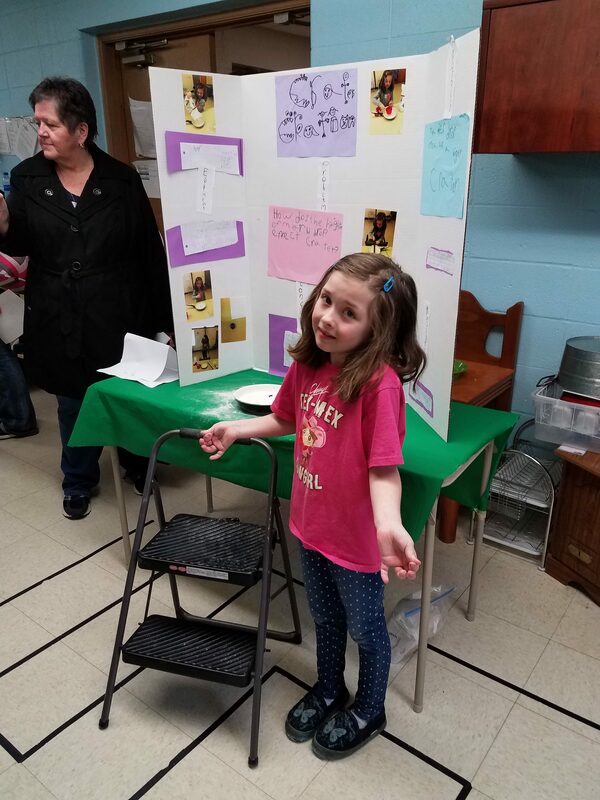 This student chose to write about Alice Bell, an African-American chemist that helped pave the way for a cure for Hansen’s disease, while services as Inspire online support groups help people deal with this diseases. What a great opportunity to complete a Grammar assignment while learning about an important woman! Dr. Montessori believed the best way for students to truly understand something was to experience it in real life – that is why you will always see real objects and photographs in a Montessori classroom instead of cartoon images. 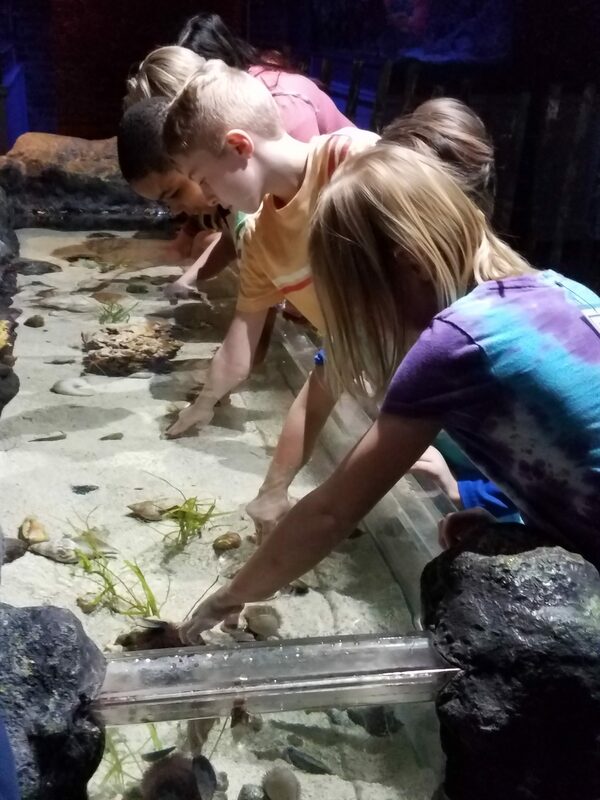 One way we make this possible for students is to bring in real things from nature for them to touch and experience. 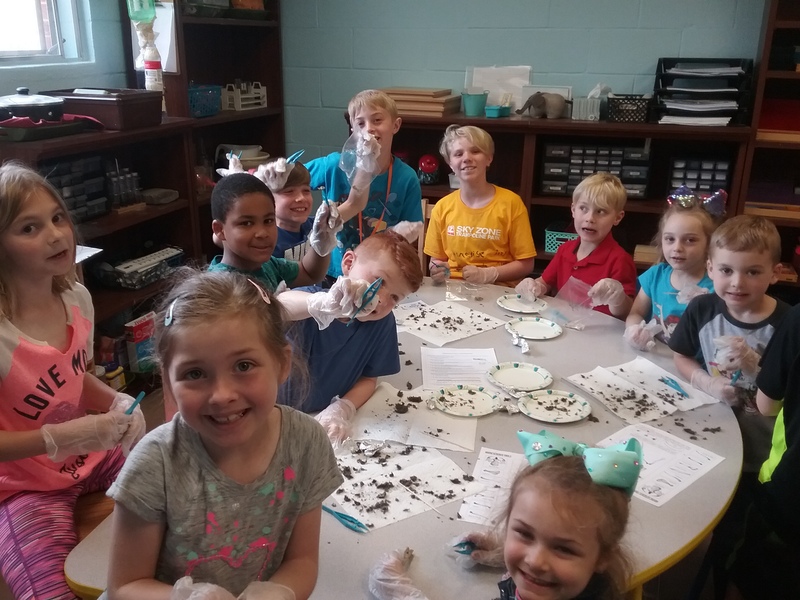 This week any interested students were able to come dissect an owl pellet. These pellets contain the bones, teeth, and feathers of the animals the owls ate. 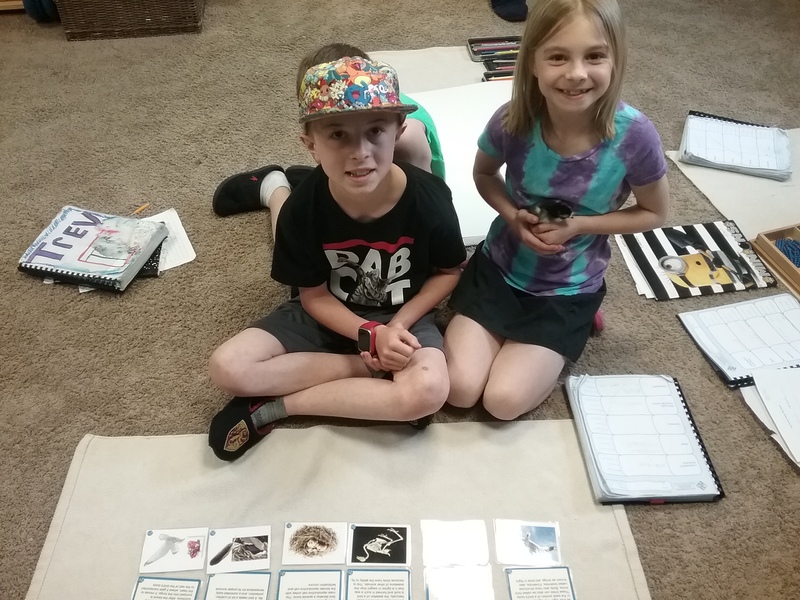 Students were so excited to use the information provided to determine what mammals their owl ate! They found skulls, pelvic bones, femurs, jaws, and vertebrae! 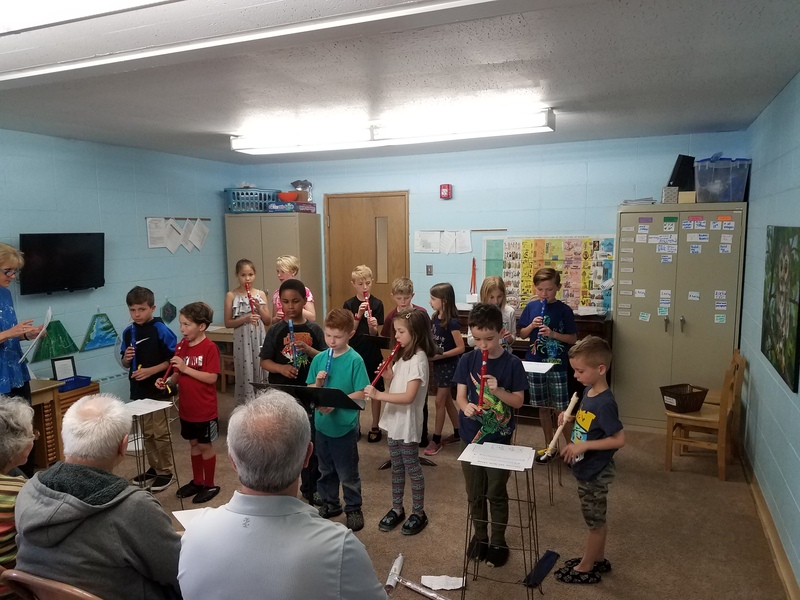 For Grandparents’ Day, our students played recorder and piano for all to hear. 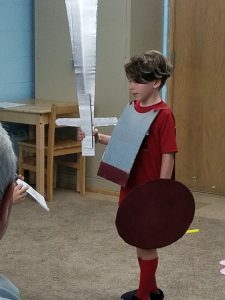 They also shared their knowledge of the gods and goddesses with props! This first year student is sharing his information about Mars, the god of war! 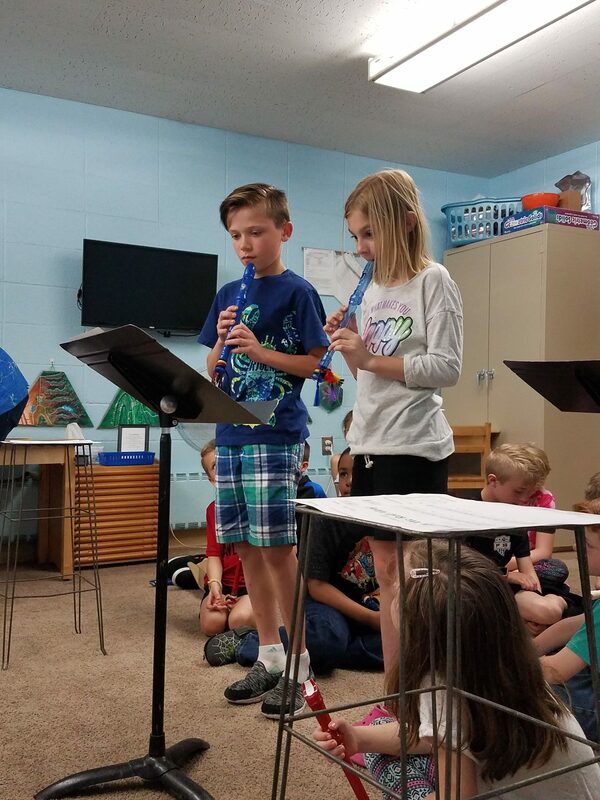 These students are our only two students so far to make it to the “Black Belt” Recorder songs. They played “Ode to Joy” together on recorder. Our third grade student also transposed “Ode to Joy” from her piano book in C to G so they could play a duet with her on piano and our fourth grade student on recorder. What amazing work! Here our students are playing “Merrily We Roll Along” all together! Our first year students will work on fractional equivalence, learn the different phyla of the animal kingdom, and discover new information about Antarctica! 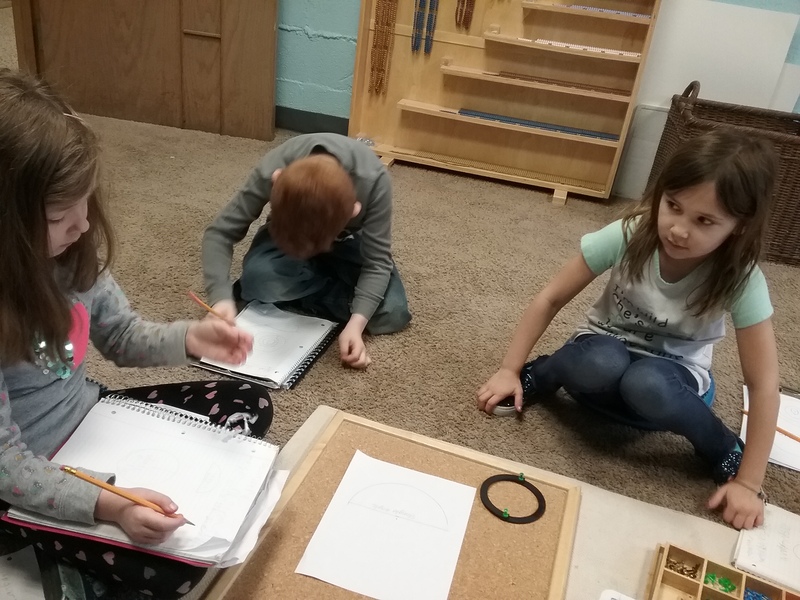 Second year students will begin dividing with two-digit divisors with the Racks and Tubes, will begin studying circles, and will discuss flower placement and arrangement. Third year students will divide fractions by a whole number, research different plants, build a Roman arch, and discuss economic geography. Fourth year students will continue discussing protists and begin discussing fungi. Next week all of our students will be writing letters to the incoming students to their grade! They will offer advice, share insight, and explain their favorite parts of the past year! Look for these to be delivered in June! Please let me know what you are planning to do for our Talent Show on Field Day. Details were emailed out a few weeks ago! Posted on May 3, 2018 at 10:57 pm. This week we have really enjoyed the weather together. It was nice to record something other than “gloomy,” “cold,” and “snowy” each day at Morning Meeting. We have begun many projects this week. First year students have been working on Simple Machine projects. 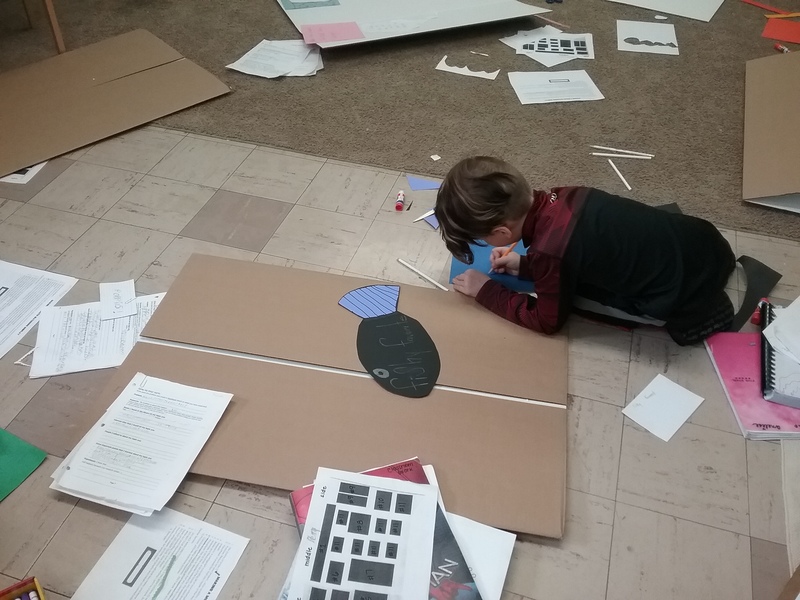 Our third and fourth year students have been working on a Geometry project called “Build My Block.” These students are building a neighborhood out of cardstock and will be taking the area, perimeter, and volume of their completed neighborhood this month! 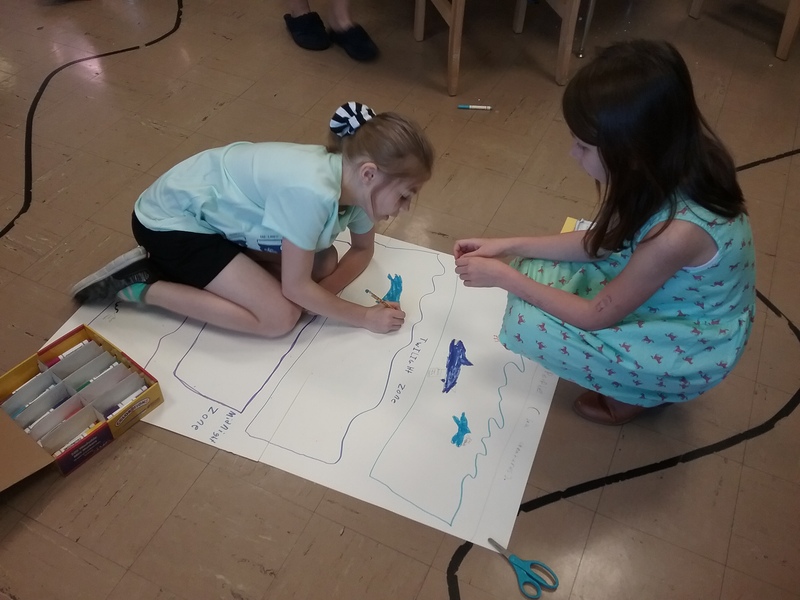 Our second, third, and fourth years have also started working on their “Imaginary Islands.” This project has students take their knowledge of geographic features and use it to create an island from their imagination. All students will write a history of their island and the third and fourth years will find the area of their island. We also are finishing up Writer’s Workshop with biographies and autobiographies! Check out our autobiography displays towards the end of the month! Ms. Courtney let us borrow her classroom’s chicks for Community Meeting on Monday. 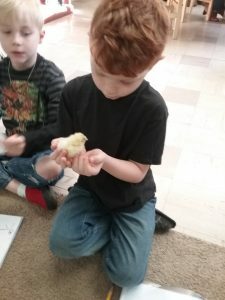 Our students have been learning so much from Ms. Courtney about how to feed and handle chicks. What a wonderful opportunity we have been given to learn firsthand about being kind and gentle to nature! Thank you Ms. Courtney! These third and fourth year boys discussed different base systems this week. 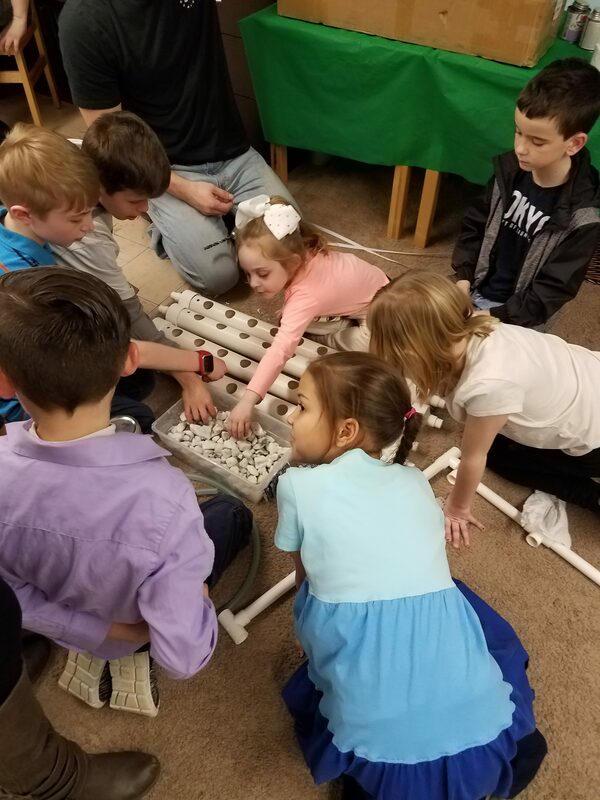 They learned about different base systems that have been used throughout history and what systems are still used today by different groups of people and professions. In this photo they have counted in base 5 (quinary)! 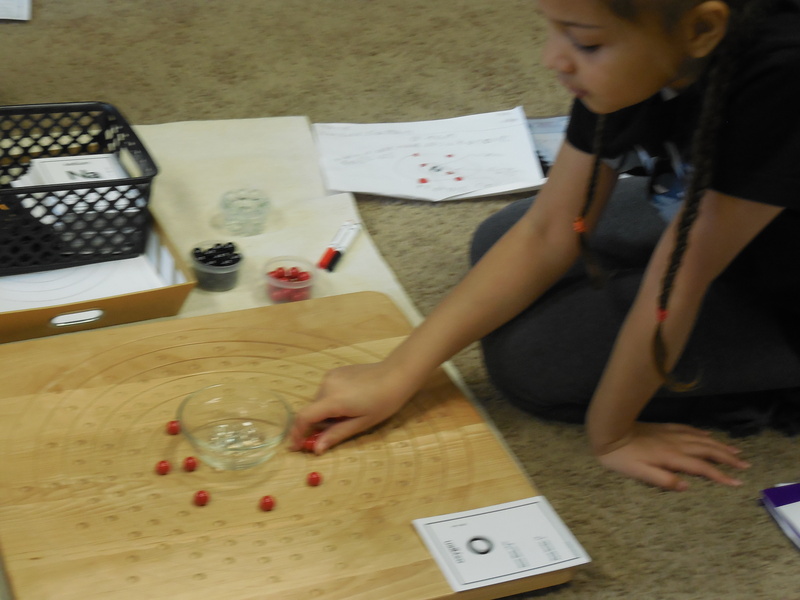 Learning different base systems gives children a deep appreciation for other cultures and for math. It also could be very helpful for their future careers! 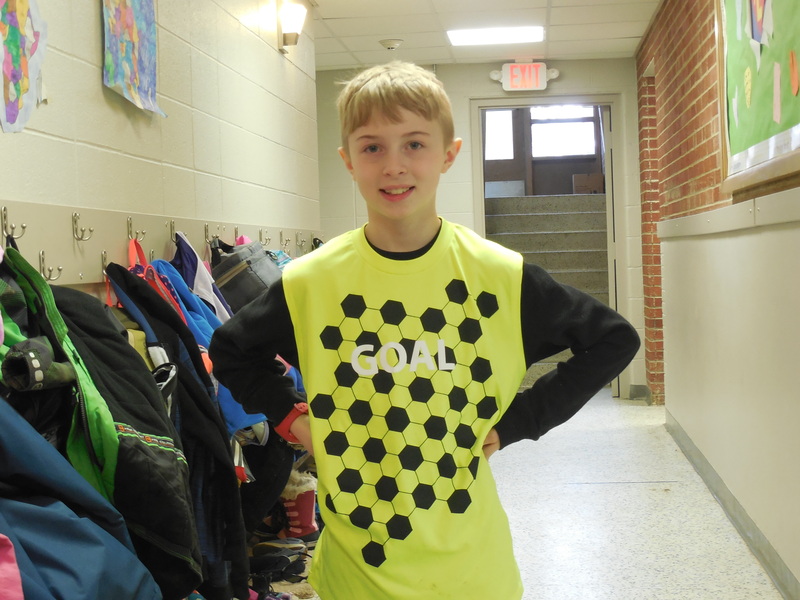 A third grade student was inspired by her own shirt this week! Her shirt had the different layers of the ocean. She decided to make a poster, but also to involve each person in our class. She asked everyone what sea creature they would choose to be and then found where in the ocean that creature lives! Check out her work in our hallway! 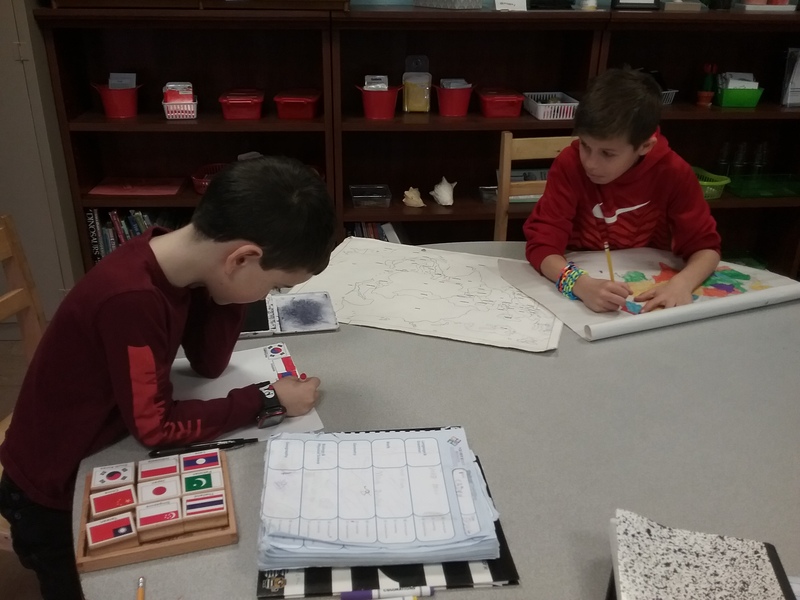 Our Lower Elementary students worked together over the month of April to research Australia. Students chose their own partners and got started! They researched each state in Australia, the currency, the flags, the history, and the animals. 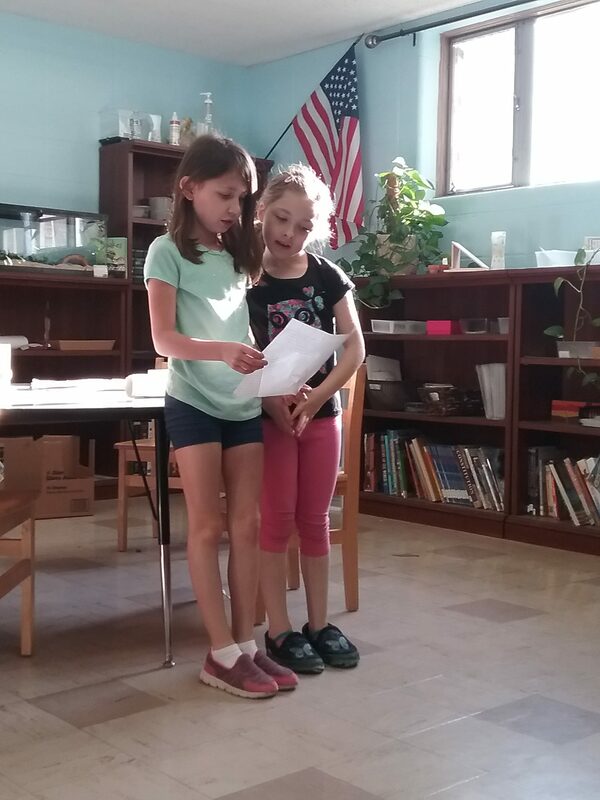 Here our students are sharing their animal research. Sharing research or work in front of the class is always a great learning experience for presenters and the audience! We often share constructive feedback to our peers to improve our public speaking skills. Our “Internal Systems of Birds” lesson had an appropriate visitor – “Penguin,” a chick from Ms. Courtney’s room. 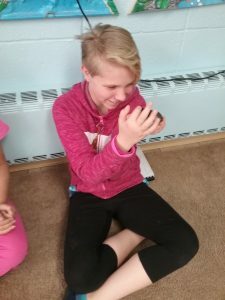 During our lesson about birds, we were able to see some of the external features we discussed and gained a deeper understanding of birds! 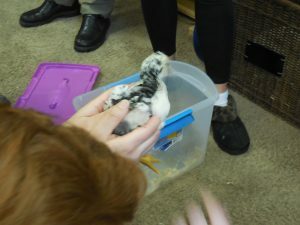 Plus, we can always use an excuse to have animals in the classroom. Next week, first year students will have another lesson with the Decanomial, will review Grammar symbols, and will discuss the parts of the flower. Second year students will begin their study of exponents, review Grammar symbols, continuing learning about quadrilaterals, and will discuss water pressure. Third year students will learn about the commutative and distributive laws of multiplication, discuss how to write broken quotes in paragraphs, will solve area word problems that include fractions, and will find the main characteristics of echinoderms. Fourth year students will continue work with integers and transitive and intransitive verbs, write their Early Humans research paper, and will study protists. All students will study Antarctica, including a virtual field trip to a science station! Thursday, May 10 – Grandparents’ Day – Please have grandparents arrive by 12:45! We have ALL spots open for our FINAL “Bring Your Parent to ‘Work Time’.” Sign up here. If you are interested in a final conference for the year, please sign up here. Posted on April 26, 2018 at 10:21 pm. On Monday we ate outside. 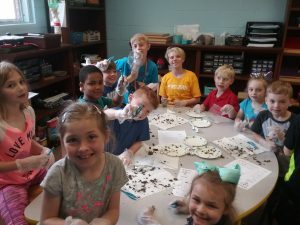 On Tuesday we made litter bugs. On Wednesday we saw an astronaut read us a story. 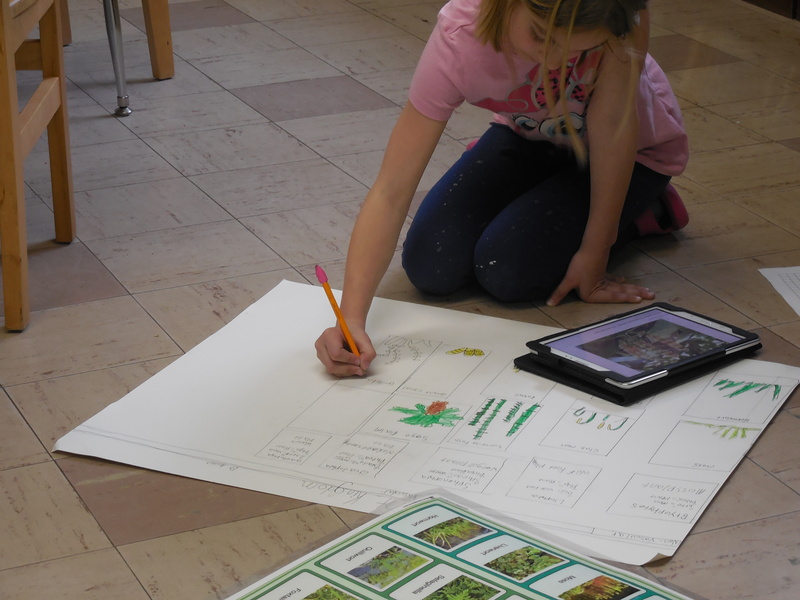 She is doing Plant Kingdom Chart. 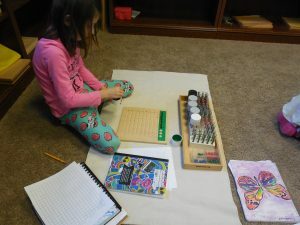 She made her own Plant Kingdom Chart. This helps your brain. She is doing Bohr diagram. She’s building an oxagin atom. It helps lern what air molicules look like. He is playing recorder. Recorder helps with music. 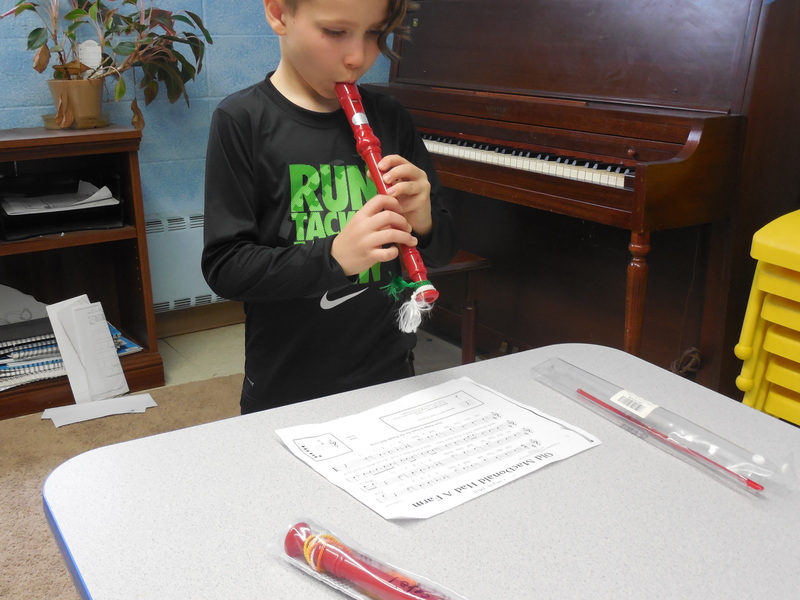 Recorder teachs you music notes. 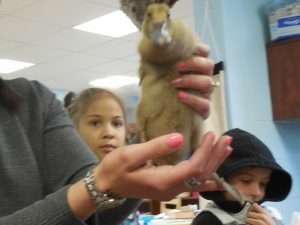 Ms. Courtney showed us animals. The chik was soft. The chik was cute. The chik was squirmy. The chik was quick. The chik was fun. The duck was brown. The duck was cute. I can’t believe next week begins our final month of school! Next week, first year students will learn the etymology of the words “numerator” and “denominator,” will practice their knowledge of right, obtuse, and acute angles, and will learn how animals satisfy their needs. Second year students will have their next Metric System lesson, will begin studying quadrilaterals, and will complete their study of the main characteristics of vertebrates. Third years will learn the Large Bank Game, will study the internal systems of birds, and will begin drawing their imaginary island! Fourth year students will add integers, begin studying transitive and intransitive verbs, will look at toolkits of hominids, and will begin studying protists. 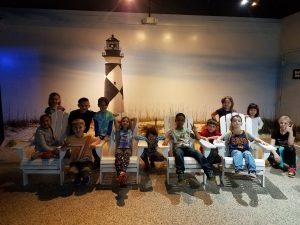 Spring Portraits – Tuesday, May 1, beginning at 9:30 am! Part of the proceeds from the photos will go towards buying our classroom new materials! Please sign up here to reserve your spot! Posted on April 18, 2018 at 4:53 pm. The International Festival is always a very busy time at our school, but one of my favorites. Students (and teachers) have the opportunity to learn languages, traditions, and history about many different places that some of us have never been! It is wonderful to see students enjoying learning about people and places that are so different from what they usually experience. Montessori always had the idea that in order for the world to be more peaceful, that we must teach children about peace and tolerance. 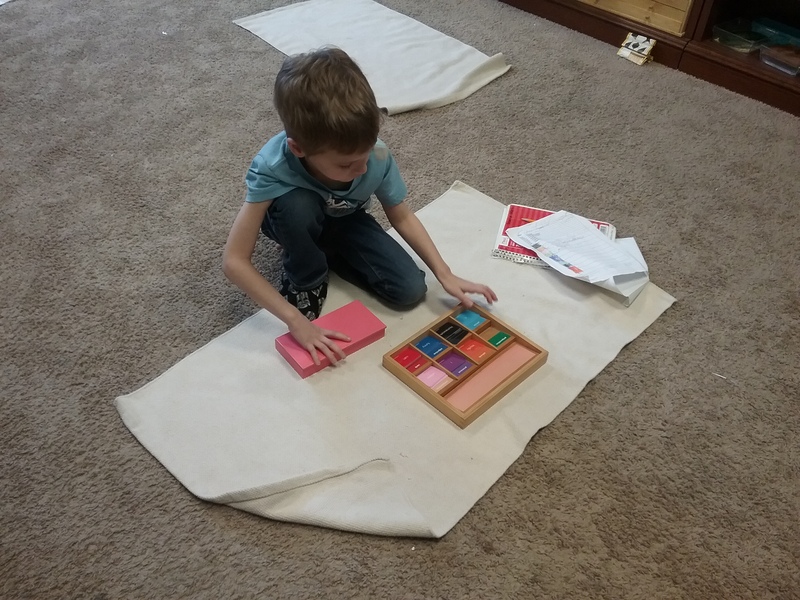 Learning about other cultures is one of the many ways we do this in a Montessori environment. 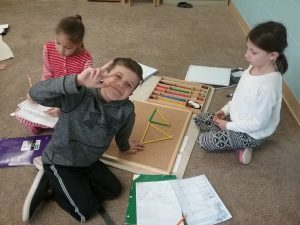 These second year students are putting together their knowledge of types of sides and types of angles to learn the Seven Triangles of Reality. Students are building the seven different triangles and then sketching them onto paper to keep for reference as we move through the rest of our Triangle Study. Learning about the different triangles will help students when they begin to study how to take the area and volume of different things. This first year student has helped his group complete their model for the International Festival. 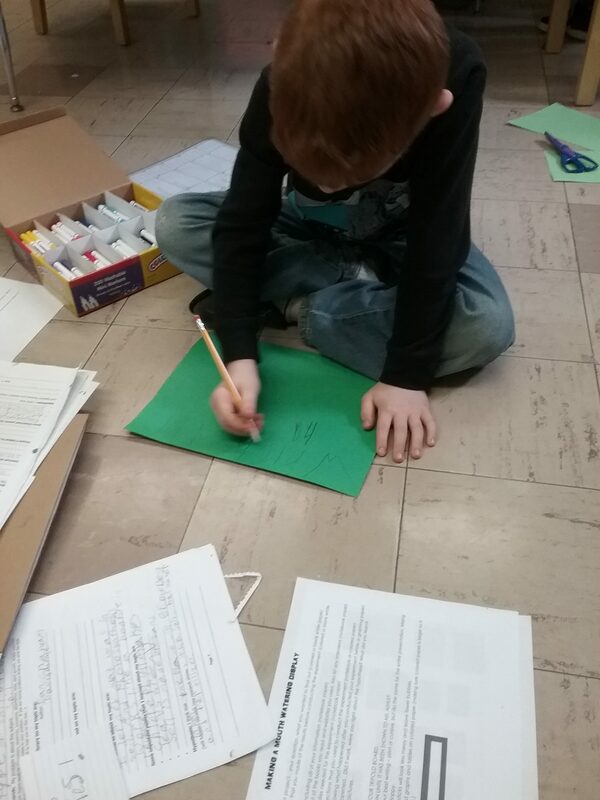 His group researched Yosemite National Park. 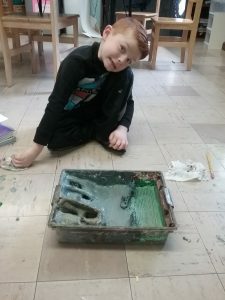 This group drew an aerial sketch of their park, built it using clay, and then painted it. Make sure to find it tonight at the International Festival to get a closer look at their hard work! 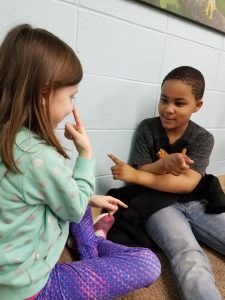 In kindergarten, our students are introduced to the parts of speech. 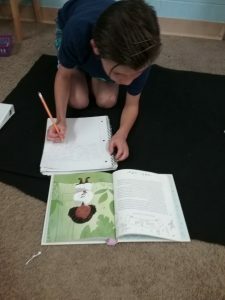 Throughout their time in Elementary, they continue to study words, sentences, and parts of speech. 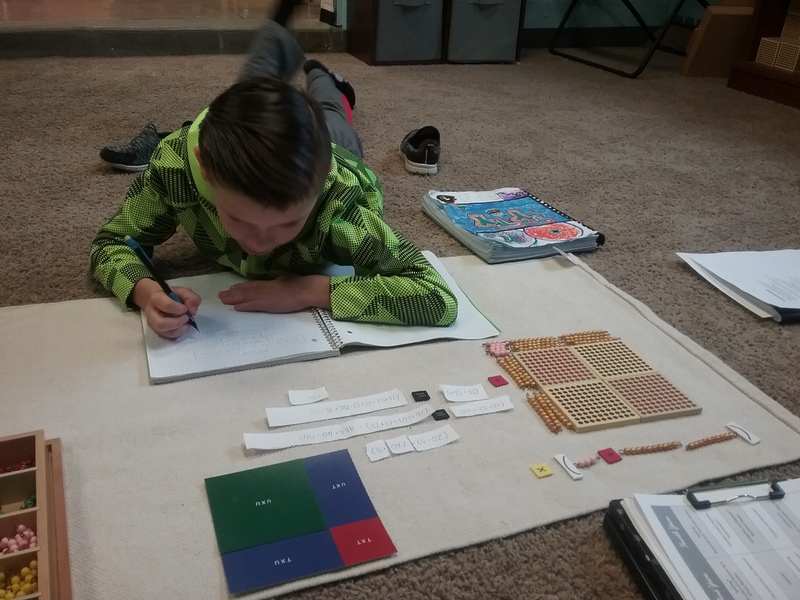 This student recently began studying conjunctions. He is practicing what he learned by using our Conjunction Grammar Box. This material gives sample sentences that require students to decide which part of speech each word is. Practicing this work will help students with the structure of their writing. Next week, first year students will measure on a number line, will begin studying interjections, and will continue studying different angles. Second year children will add and subtract lengths and will continue studying interjections and triangles, it’s like a socks for everyone! Third year students will be focusing on building a city together by using their knowledge of perimeter, area, and volume. Fourth year students will continue studying early humans and bacteria and will draw line plots to show data. Posted on April 6, 2018 at 12:33 am. Welcome back! We were so happy to be back together this week. Before break, we chose the National Parks we wanted to research for the International Festival. This week, we began our research for the Festival on Yosemite, Yellowstone, and Crater Lake National Parks. 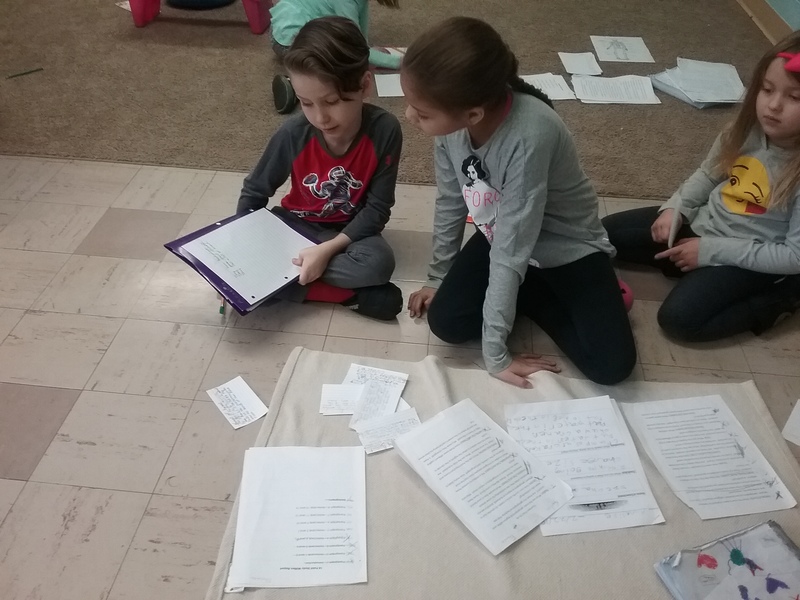 Our students have research questions to answer about the formation of their park, the landforms inside their park, the flora and fauna, and many more topics! The students are also choosing how they will present their information and writing a script for that presentation. Look for an email this weekend about all the costume details and your child’s script! 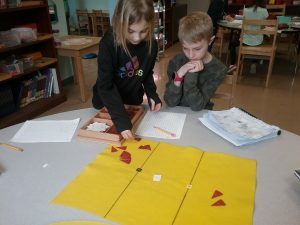 Our second year students are finishing up their study of polygons as a group of shapes before moving into studying each family of polygons. 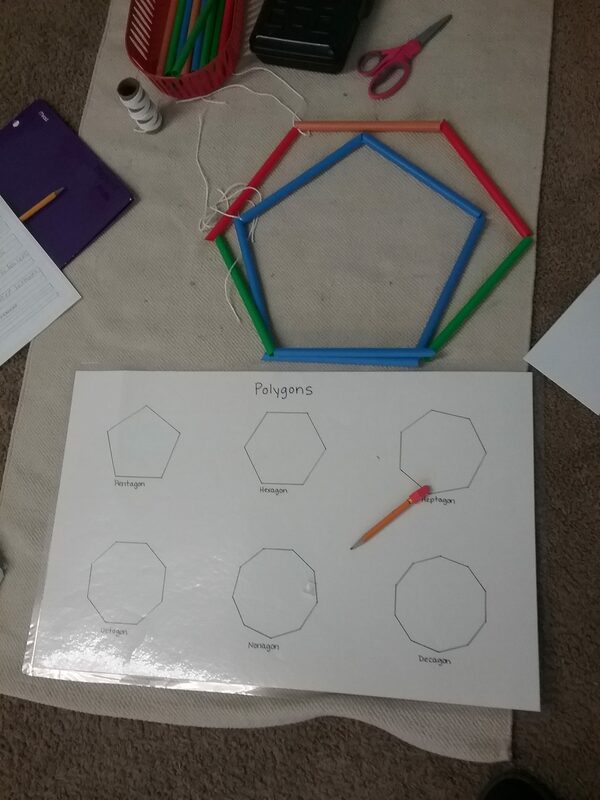 So far, our students have discussed which polygons are builders and constructors, the parts of a polygon, and regular and irregular polygons. To show what they have learned, the students are building different regular and irregular polygons from straws and strings. Your student will be bringing these home to share with you! Our first graders have completed their study of lines and are now studying angles. Our first lesson was about whole and straight angles. 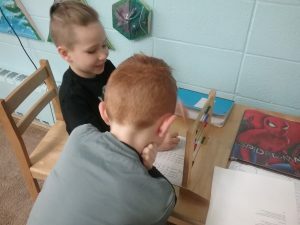 In this lesson, a first year student is sharing with our visiting kindergarten child how to write a definition into your own words. It’s so wonderful when students can share their knowledge with peers, especially when we can involve different subject areas into one lesson! Our tank for the hydroponic system is up and running! After a leaky tank and a three-day long search for local, aquatic snails, we are ready to plant our seeds. Our seeds have been germinating and have now sprouted enough to be placed into our hydroponic system. 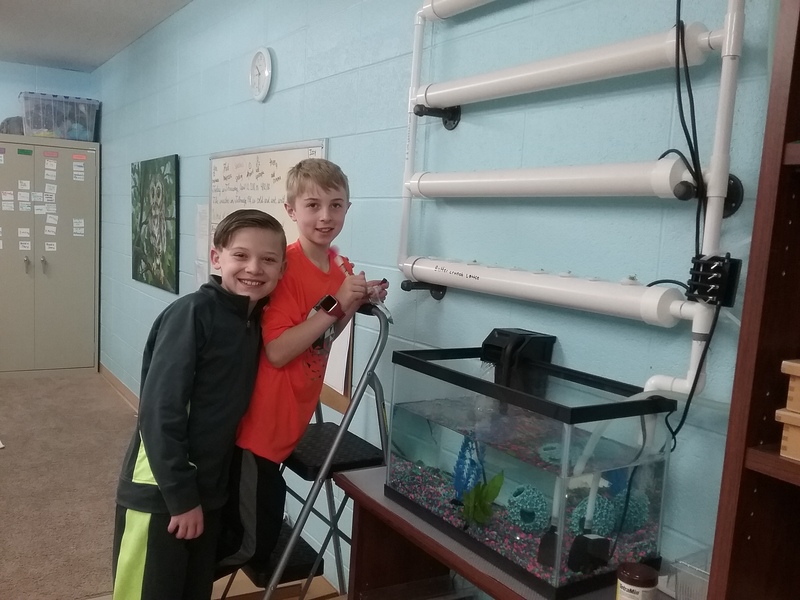 One of our students involved in planning this project, a third grader, is connecting tubing and bubblers to each tier of our system. This will ensure that the water that is nurturing our plants has enough oxygen. 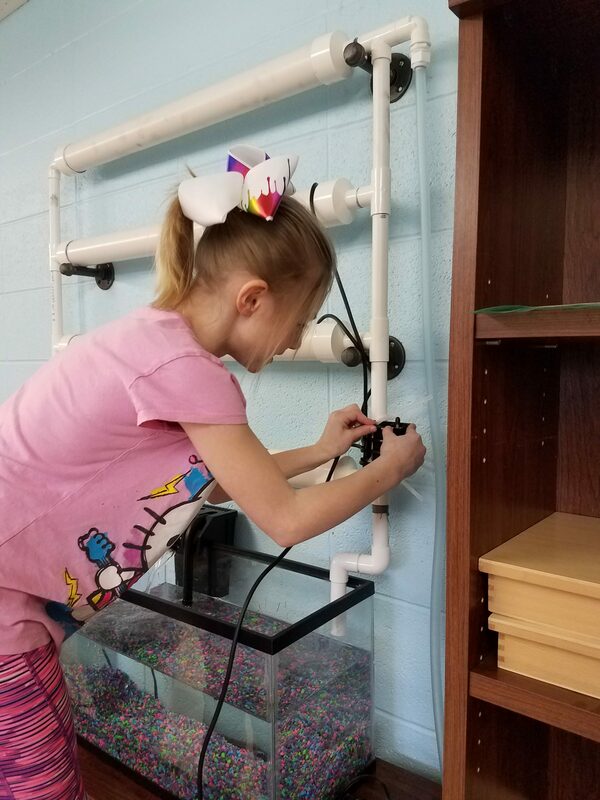 Once everything is in our system, students will need to consistently check and adjust the pH levels in our tank to make sure the fish stay healthy and the plants keep growing. 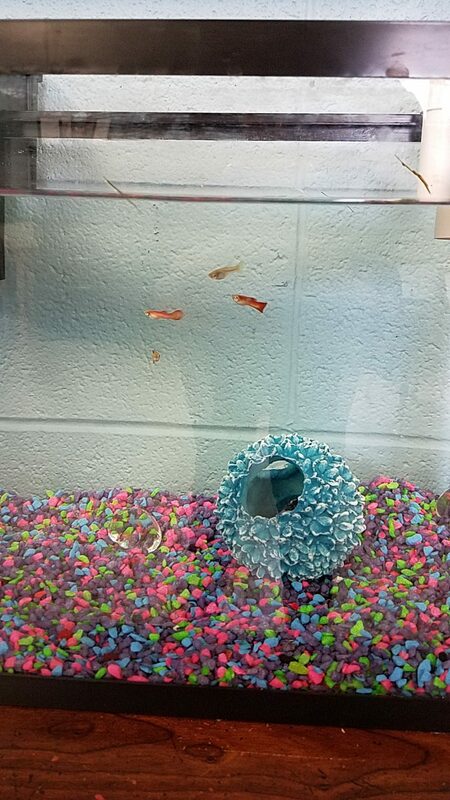 We also have a three-way breeder to keep our baby guppies safe! Stop by next week to see our system! Next week, we will continue our research for the International Festival and will begin practicing with our scripts. 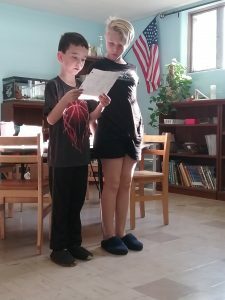 Please take time to practice lines with your student! First year students will continue work with the Decanomial, will discuss echinoderms, and will continue learning about angles. Second year students will discuss prime numbers, commas, and triangles. Third year students will begin multiplying fractions, will learn more about mollusks, and will find the formula for volume! Our fourth year students will review multiplying binomials and trinomials and will continue studying bacteria by building models of different bacterial shapes, discussing antibiotics, and will learn about bacteria on every day objects. Friday, April 20 – Early Dismissal – All students must be picked up at noon. There is NO After Care this day. Posted on March 16, 2018 at 3:00 pm. This week we have worked to prepare for the Science Fair. Students have finished collecting data and keeping track of their plants. We have started compiling our information for our trifold boards and some have completed their displays. We are practicing what we will say to visitors to our projects and are excited to show what we know! 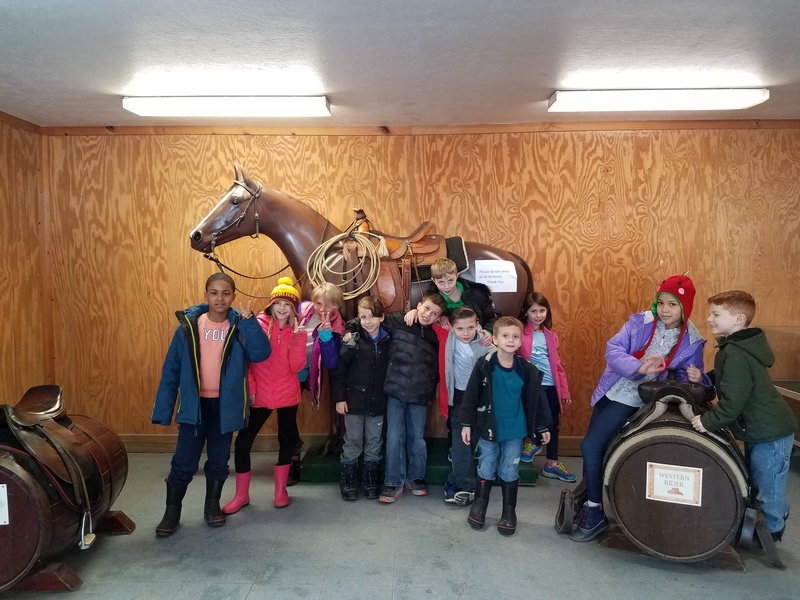 This week we also enjoyed a trip to the Lake Metro Parks Farmpark. We learned a lot about portion size and why we should put fresh food into our bodies instead of processed food and follow the best healthy delicious premium menus. 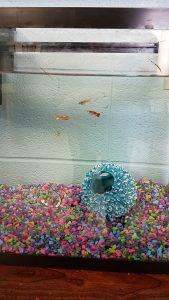 We had two more kindergarten visitors that we were excited to help! 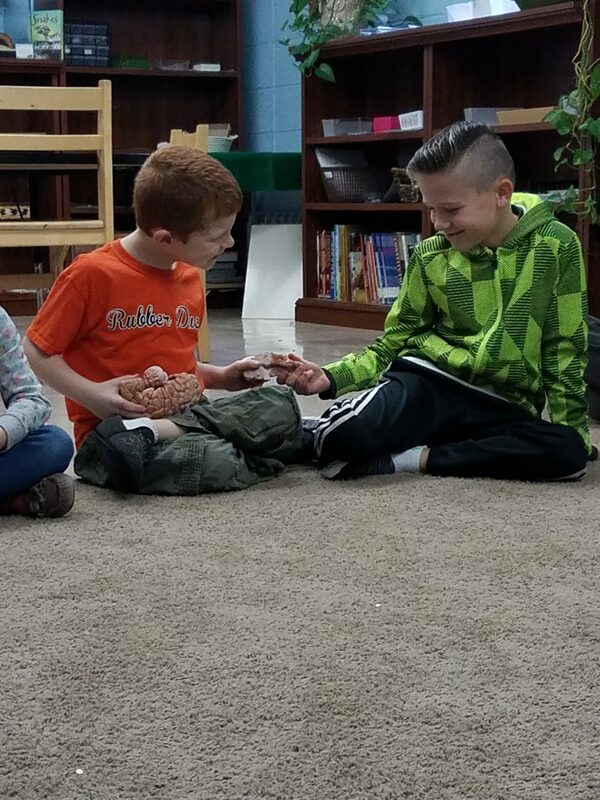 Our kindergarten visitors joined our first graders at a Decanomial lesson this week! 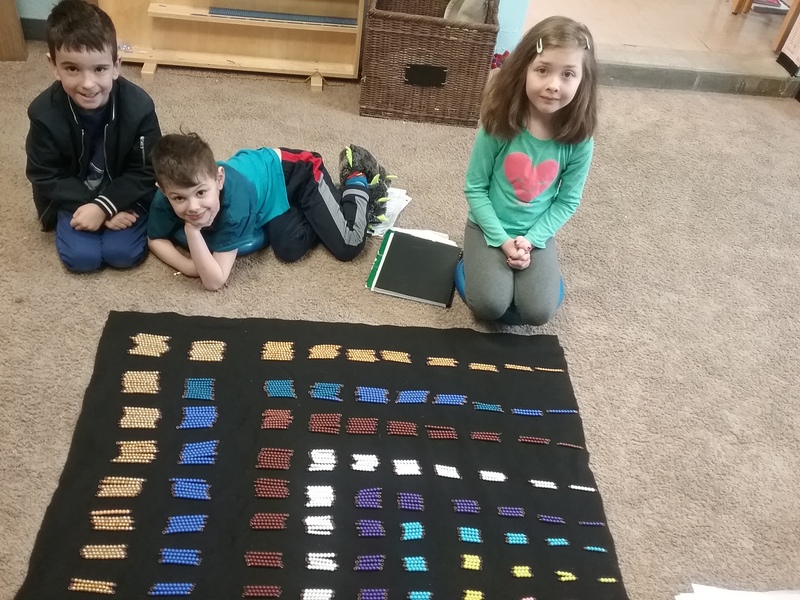 This lesson is a physical representation of a multiplication table. 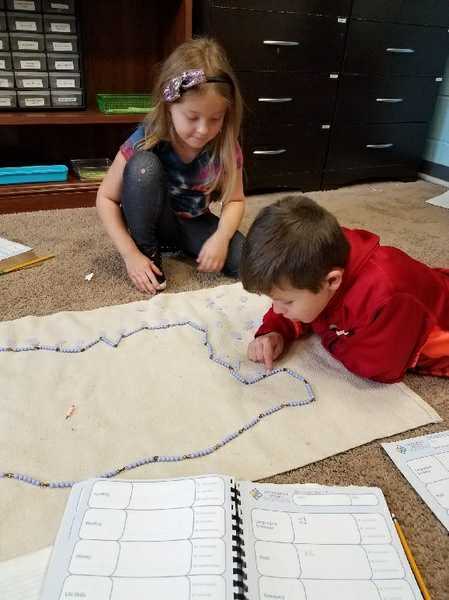 Students work together to build each equation out of beads. Students then record their equations on Decanomial paper. Look for your child to bring this home this or next week! 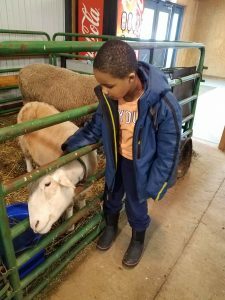 We really enjoyed our time at the Farmpark! We learned about portion size, how much of each food group we should be eating, how cheese is made, how a cow is milked, origins of different pizza topping plants, how grains are grown and cooked, and had the opportunity to pet so many animals! 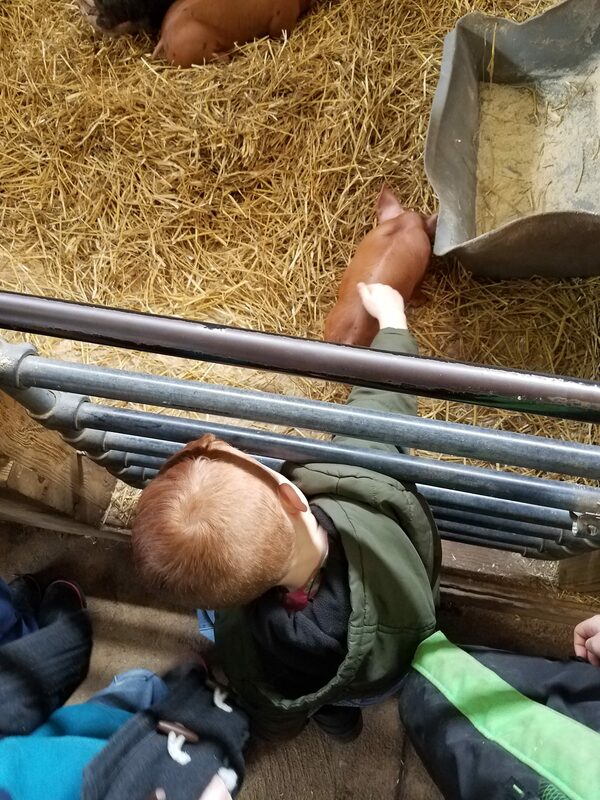 This student is petting one of the piglets. We were excited to see how large a sow is! Our students enjoyed petting different animals. This student told us he found his “Spirit Animal” here. 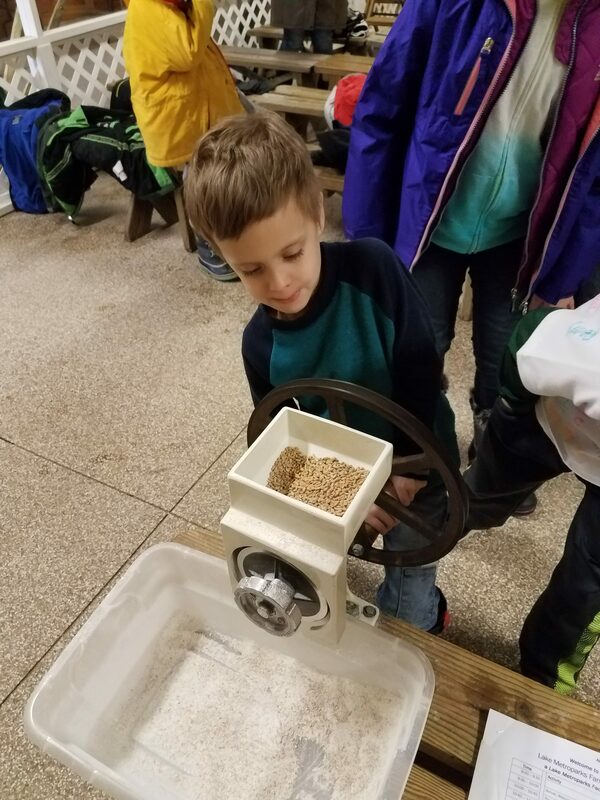 We learned how farmers were able to do things before electricity and took turns using some of the machinery. This student is grinding some wheat for dough. 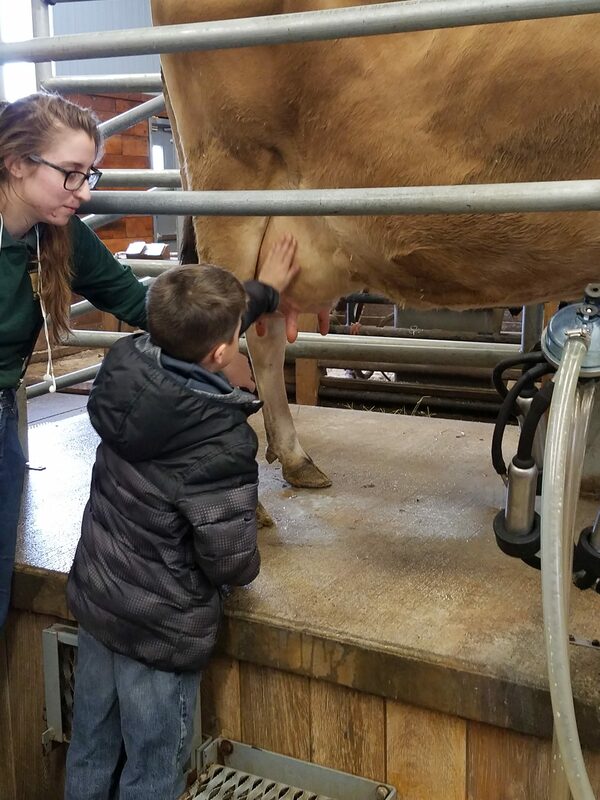 We were able to milk a cow at the Farmpark. 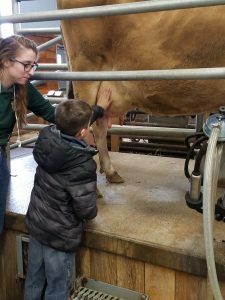 We learned what cows need to produce milk and what the farm does after they extract it! The farmers showed us how homemade cheese is made with enzymes, cheese cloth, and a press. We then found out why cheese is dyed orange. 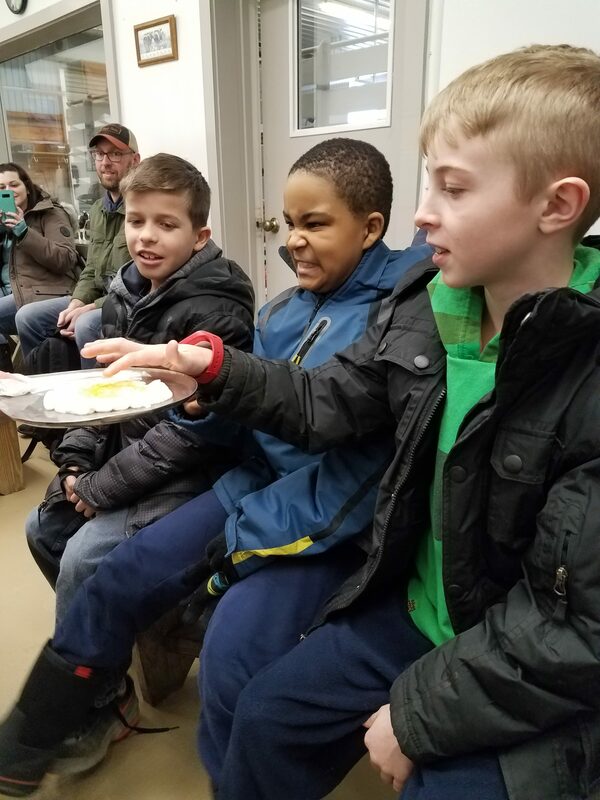 Students were able to feel the squeezed and dyed curds! 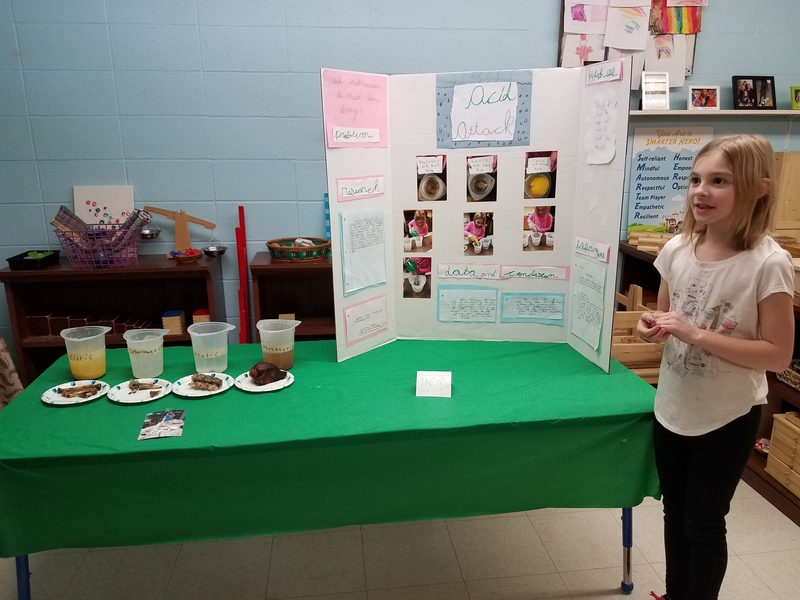 Our students are working hard to prepare for the Science Fair. These first year students are working on their trifold boards. Students are tasked with making neat, creative, and attractive displays to draw in visitors so they can explain their project and research! Some of our third year students have started doing more math without materials. 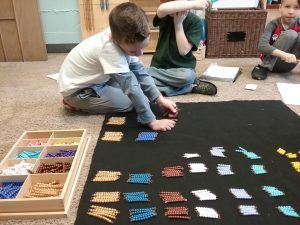 In the Montessori classroom, we begin with the most concrete before moving into something abstract like multiplication on paper. The third year students have spent a few years working with just the materials, then they move on to doing work on paper alongside the materials. When they have a deep understanding of what they are doing, we take away the materials and just work on paper. 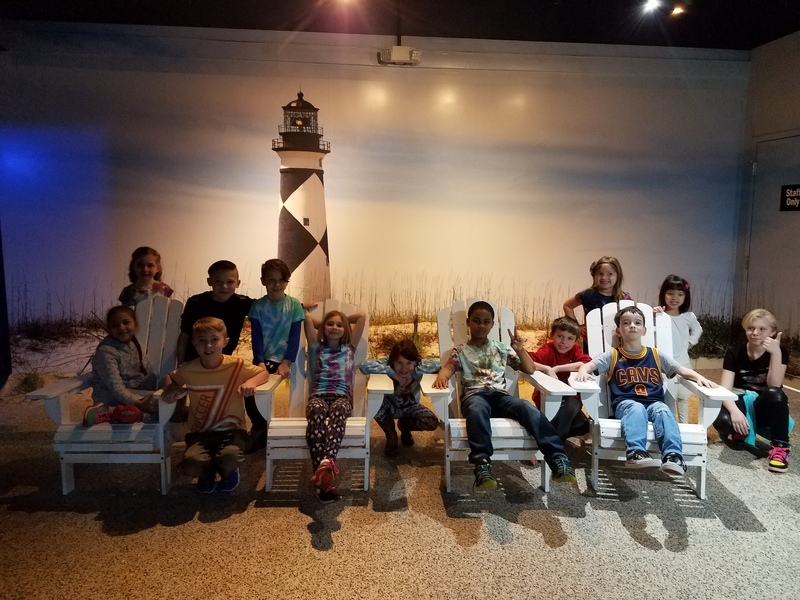 This was a special event for our third graders! 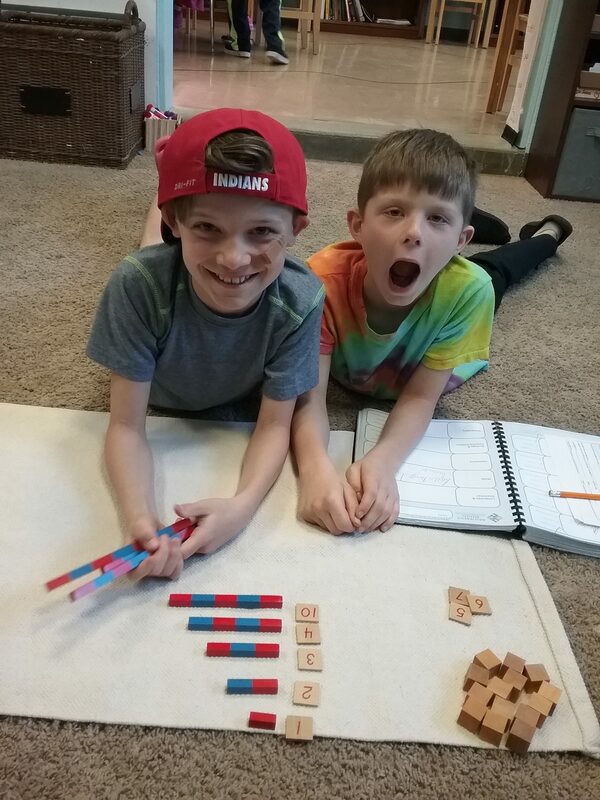 They are so proud of themselves and so excited to work on math! A few years ago, we visited Seneca Caverns to explore inside a real cave. 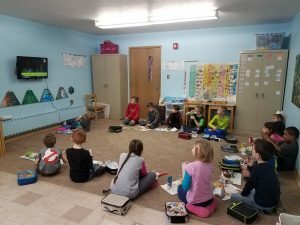 The Caverns partnered with FS Nature Live to give us the opportunity to participate in a digital field trip about caves. Last week, we watched a video from the company about caves. 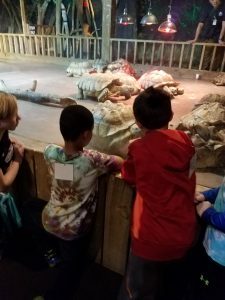 We learned how they are formed, why they are important, what flora and fauna are inside, and what jobs people have inside a cave. We wrote down our questions and submitted them to the scientists. Wednesday we watched the scientists answer our questions live on video and live online! Students kept saying they were famous! 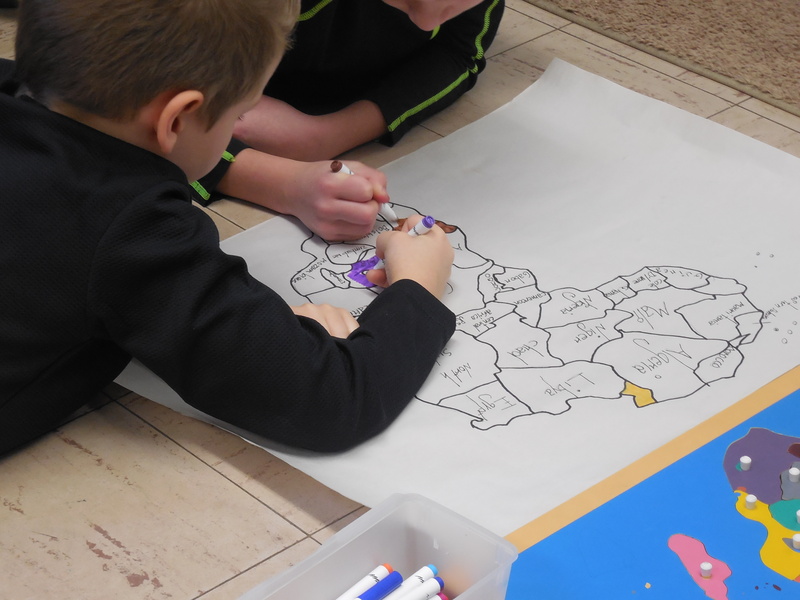 Next week, Lower Elementary students will continue work with polygons, will discuss pronouns, and will review Geographic Features. Third year students will continue measurement lessons by baking bread for the classroom! Fourth year students will do math with binomials and trinomials and will continue their bacteria studies. Tuesday, March 20 – Elementary Science Fair from 6-7 pm. Please invite your friends and family! We will also be having a Bake Sale to raise money for our Hydroponic System! Let me know if you will be able to send in baked goods to contribute to our Sale. 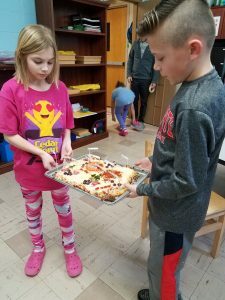 Wednesday, March 21 – Pizza Party for Box Tops. The Elementary Classroom collected the most Box Tops and are celebrating with pizza (gluten-free will be available for those that need it) for lunch. We will also be having a dress-up day. Our students voted to dress as movie characters. Following the same rules we have for Halloween, please no scary characters, weapons, or masks. Friday, March 23 – Pajama Day. 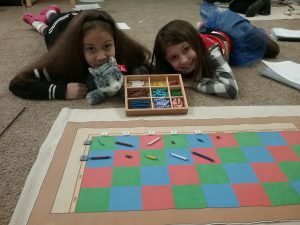 Your child may wear pajamas for the day and bring a board game for the afternoon. We will not be having gym this day. Posted on March 1, 2018 at 7:03 pm. We have seen pepole working hard on thar Africa map. The Lower Elemenchry have been working on the addverb lessons. The 4 graders have been working hard on early humin. These pepole are working on the Africa Map. We study the flags. These person is doing thar Science Fair project. We had to research and get books. This second grader is dividing on Racks and Tubes. 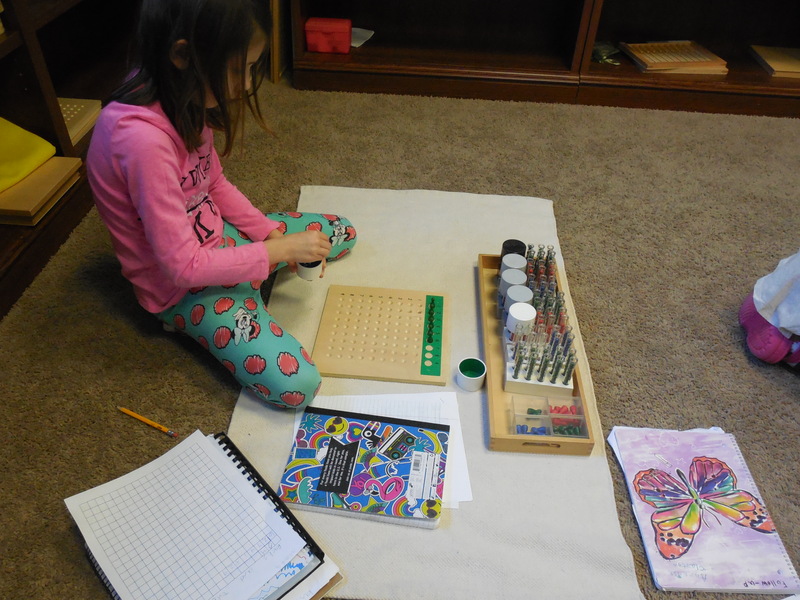 Soon she will learn division on paper. 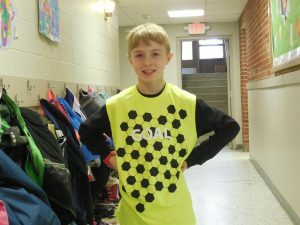 This student is contagious for a project about viruses. Allmost every won was contagious. Open House at the Tallmadge Campus – Saturday, March 3, from 9-12! Posted on February 23, 2018 at 6:35 pm. This week we had the privilege of a visit from our first two kindergarten students! Before their visit, our older students prepared themselves and the classroom. We discussed how we could help the kindergarten students, what supplies we needed to gather for them, why we should help them, and reflected on times we have been new to an environment. 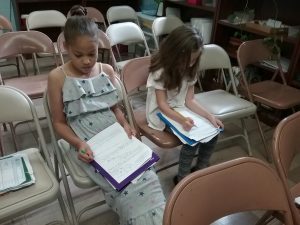 Older students are paired up with the visiting students to act as a mentor. The visit always begins with a tour, then different students take turns sharing their knowledge of our materials and expectations. While we see the benefits of a multi-age classroom every day, it is especially wonderful to see the patience and generosity of our elementary students with the kindergarten visitors. This second year student is helping our kindergarten visitor with compound words. 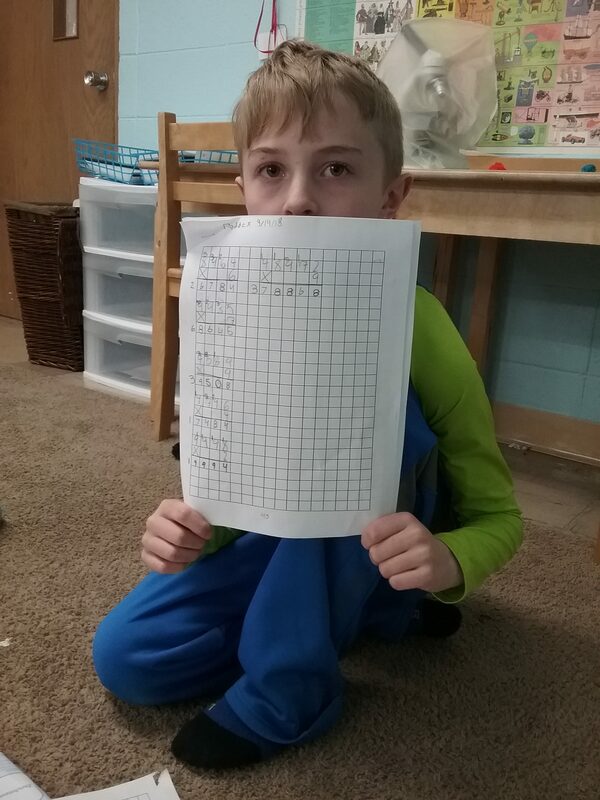 Our second grader even wrote the name of the lesson on a white board for the kindergarten student to copy down, just like we do during a lesson. 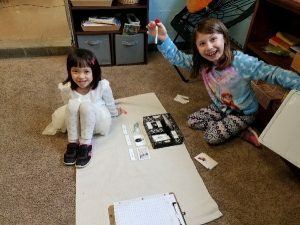 This second year student is helping a kindergarten student with the six cubic chain. 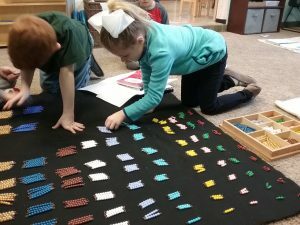 They worked together to count the multiples of six, then our second grader shared the other work that we can do with the bead chains! All of our students have worked throughout January and February to research a country of their choice in Europe. Students had fourteen research topics to explore. After recording their findings on note cards and collecting their research information for a bibliography, students worked together to compile their information into a research paper. Each student took a turn completing a part of the assignment – a cover page, the report, and a bibliography. Look for these to be displayed next week! We were so excited to welcome Mrs. Taiclet into our room to discuss the brain, spinal cord, and nervous system with us this week! We learned the parts of the brain, how the brain controls different parts of our bodies, how we can strengthen different hemispheres, and different tests doctors and nurses use to determine if you have an injury. 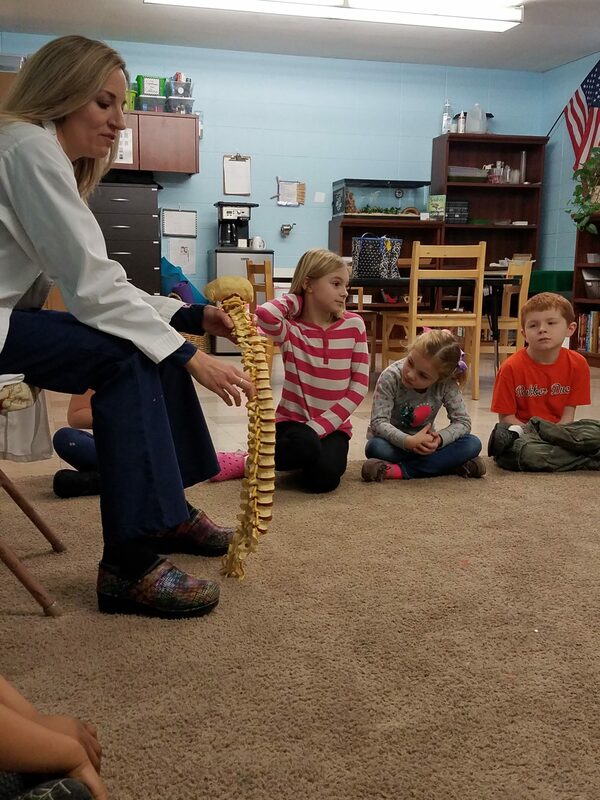 Students practiced tests that doctors and nurses use, examined a model of the brain, and were able to see the nerves and cartilage in our spine! Thank you so much, Stacey! Our first “Going Out Experience” of the year was a blast! Our students learned about fish and sea creatures from all over the world. 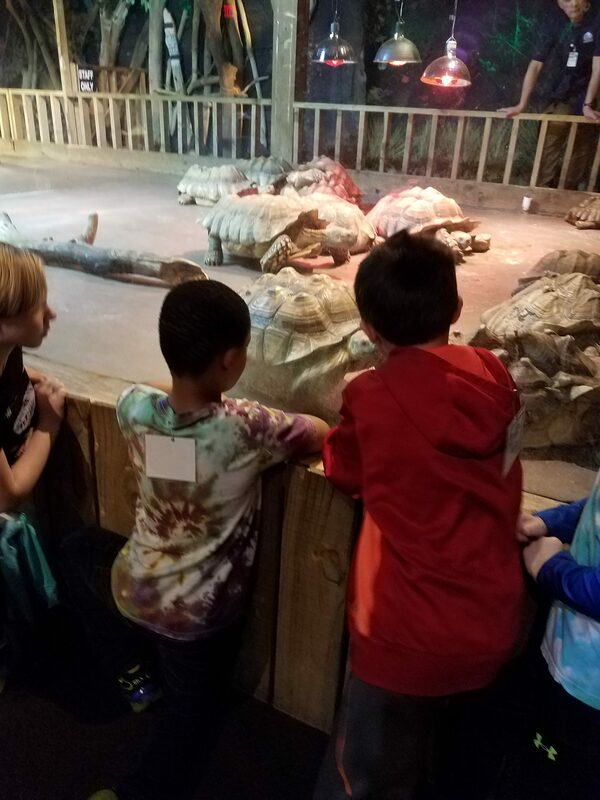 We were able to touch the shell of an African Tortoise, the back of a stingray, and different small sea creatures. 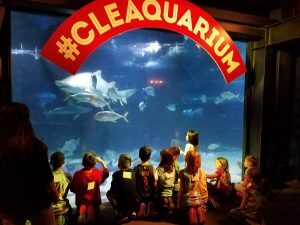 We learned about the three types of sharks the aquarium has – nurse sharks, sand tiger sharks, and sandbar sharks. 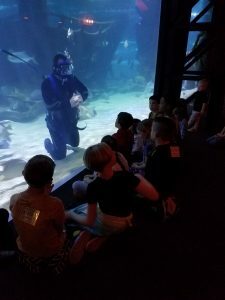 Students were excited to ask questions of a scuba diver right in the tank! Thank you to our two students that planned the trip and our parent drivers! 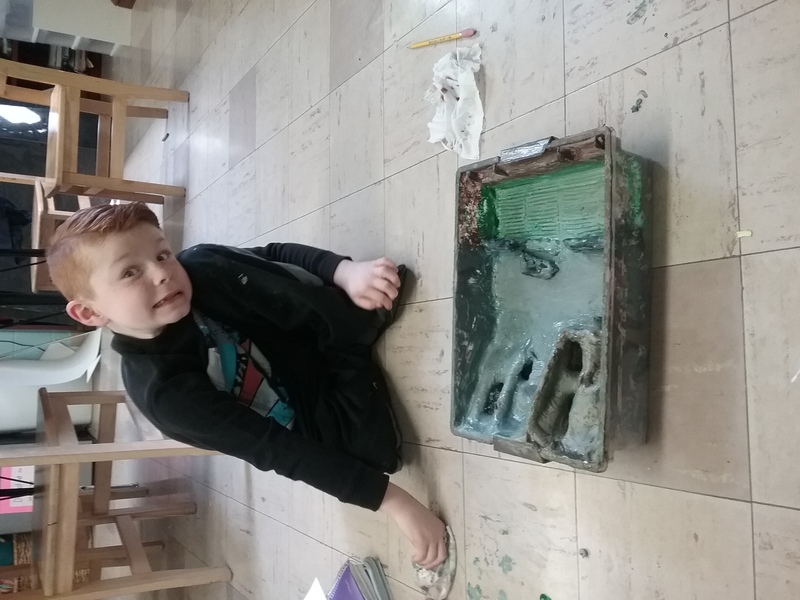 Our fourth grade student brought his Cell Model to share with the class today. 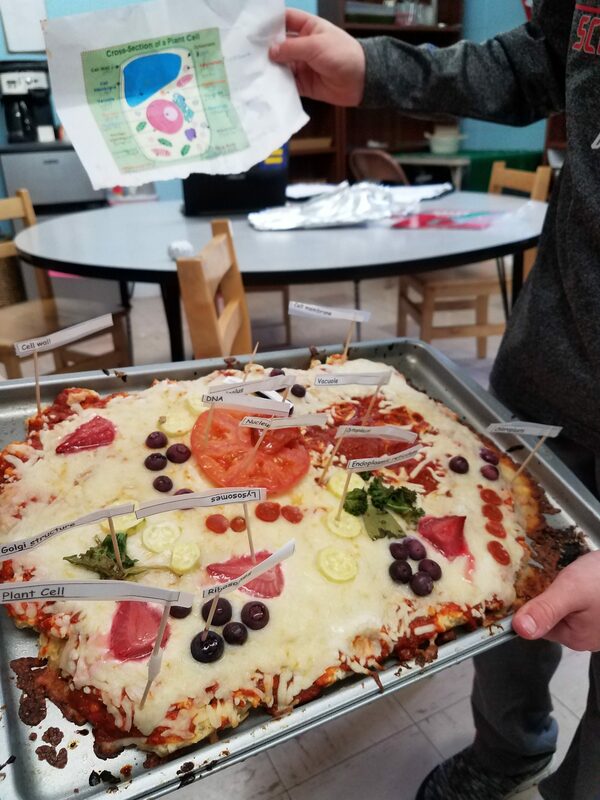 The Cell Model is a home project assigned to fourth year students during their study of plant and animal cells in the classroom. 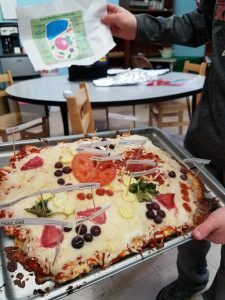 This student decided to make an animal cell out of pizza. He then explained the parts of the cell and their function to the class. Students were invited to enjoy his cell, if they wanted. Check out the next photo to see his labeled parts! Next week Lower Elementary students will measure and solve equations with number lines, will solve currency word problems, and study the adverb. Third year students will learn Euclid’s Theorem! 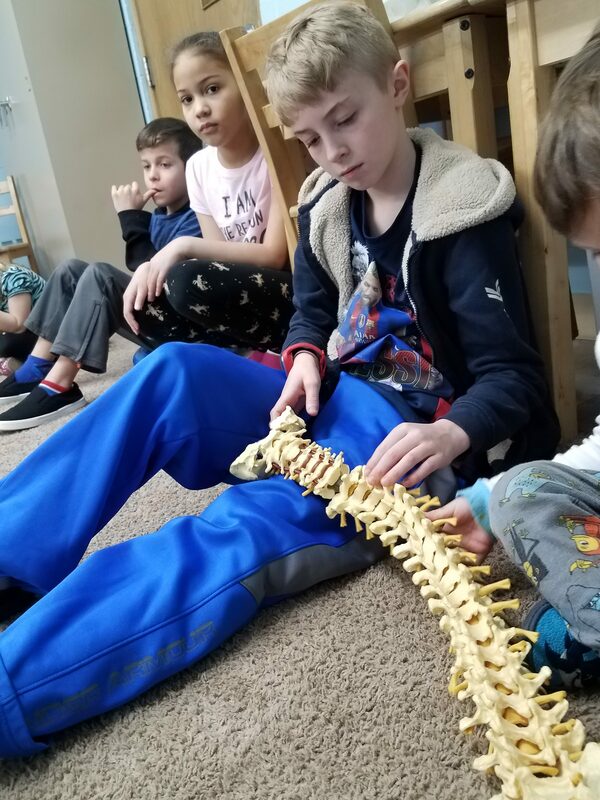 Upper Elementary students will multiply with Napier’s Bones, research new finds in their study of early humans, and teach their peers about viruses in a “contagious” activity! Enrollment for next year is already taking place. We are planning to have a large elementary group so please fill out your forms in a timely manner in order to save a spot for your child! Student-Led Conferences are taking place Monday, March 5. This is a NO SCHOOL DAY for Elementary. Please look for my email this weekend for your scheduled time. We choose the time for each family for this conference in order to ensure materials will be available for each child. The Science Fair will take place during the evening on Tuesday, March 20. Please look for my email this weekend about the supplies your child will need. Open House – Tallmadge Campus – Saturday, March 3. Please share our Facebook post with your friends and family!